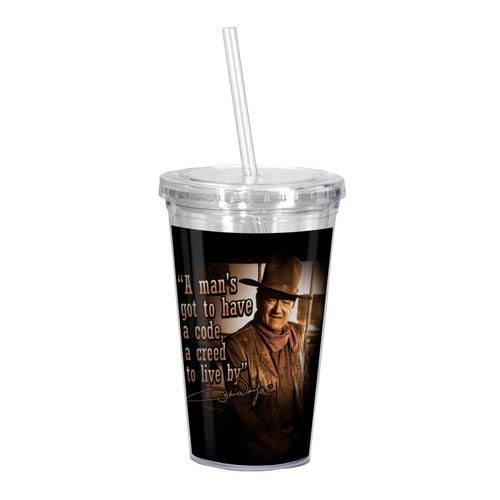 Shopping for John Wayne Travel Cups? Listen to the man. This reusable, eco-friendly, BPA-free acrylic John Wayne Creed Travel Cup measures 6-inches tall and holds 16 ounces of your hot or cold beverage du jour. It features insulated double-wall construction, a twist off lid, an acrylic straw, a familiar image of The Duke, and the phrase "A man's got to have a code, a creed to live by." Do not microwave. Hand wash only. Not dishwasher safe. Ages 13 and up.